Danforth is a premier installer of Commercial Heating, Ventilating and Air Conditioning (HVAC) systems in New York State. Commercial HVAC systems control the indoor environment of a building. Occupant comfort and safety are main drivers of having satisfied tenants and productive workers. It is imperative that your HVAC system is designed and installed correctly to optimize performance and manage operating costs. Our clients realize the value of selecting a professional team to design their HVAC systems. Our team has vast experience in determining heat loads and ventilation requirements, implementing control strategies and selecting the best HVAC equipment for the application. Our expert team of installers and field technicians ensure that your system is operating at its peak performance when we complete system turnover. We also introduce you to our Planned Preventive Maintenance staff that will be there to make sure your system continues to perform as designed. 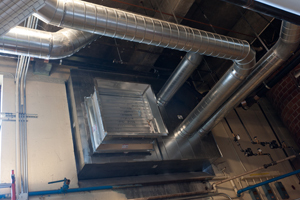 We take a proactive approach to Commercial HVAC installation. Our strength comes from our integrated services that allow for precision coordination between our field personnel and fabrication shops. Our Team has extensive experience in prefabrication which facilitates air duct, piping and equipment installation in the field. We have a history of delivering high quality, fast moving, turnkey HVAC projects to our customers. Start Your Commercial HVAC Installation Project with Danforth. Meet with one of our Commercial HVAC Installation consultants. We’ll outline our process and begin your project estimate. Need More information? Send us a quick message and we’ll reach out to you to help plan your next Commercial HVAC Installation project. Get answers about our Commercial HVAC Installation services and speak with a knowledgeable Expert.